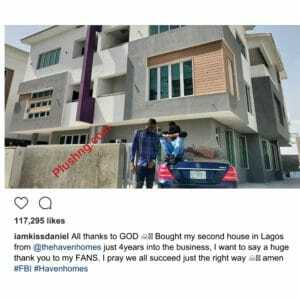 Nigerian music star, Kiss Daniel has acquired his second home in less than 4years after joining the music industry. The ‘Yeba’ singer made his testimony on gram while showing off the front view of his new home. According to listing on the site, the 5bedroom semi-detach duplex by Haven Homes is reportedly worth 95 million naira. This will definitely serve as a great addition for the music star who is still in a legal battle with his former label.